CATONSVILLE, Md. — For Sophi Wrisk, lacrosse is in her blood. She wants to keep their attention. You can bet they're all sorts of proud of what she does on the field and off of it. Sophi is a star midfielder for the Comets. She's also molding the youngest players in our area as a volunteer youth coach. “I love hanging out with little kids. I think they're the sweetest little things,” said Sophi. She is an ambassador for Nation United. It's a program that helps promote diversity in lacrosse. “It really helps kids. They might not have a local lacrosse team around. It's good for us to go help them,” she said. Sophi is also a shining Comet on the volleyball and basketball courts. It was during volleyball season when she suffered her biggest setback yet. She ended up in the hospital with a kidney infection. The recovery lasted into hoops season. She came back stronger than ever. Sophi wants to play college lacrosse at the Division I level and major in criminal law. 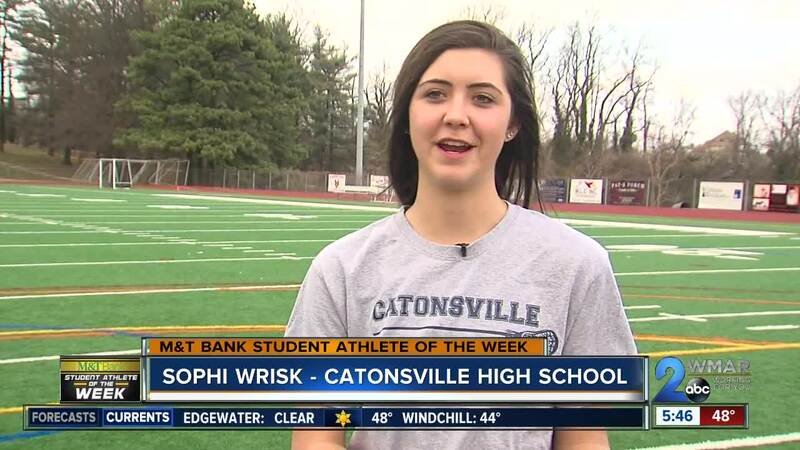 Congratulations Sophi Wrisk. You're this week's M&T Bank Student Athlete of the Week. To nominate a student athlete to be the next M&T Bank Student Athlete of the Week click here .